twice the writing length of other pens, 360 yds. (Well this is something I just have to take their word for being that I don't have a clue what other pens writing distance is - LOL! But I am thrilled that these will last a longer time being that they are SO enticing. 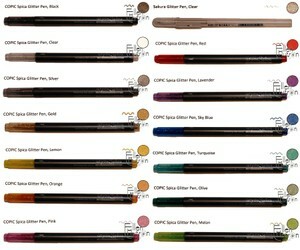 I have tried to make this color chart so that you can get a better understanding as to what these markers will look like. This chart was made on plain white paper and each circle is colored only with the Spica Glitter Pen indicated. To add a comparison I also used the Sakura Stardust Clear Glitter Pen. As you can see the Sakura pen clear really isn't clear. The advantage of the COPIC clear is that it truly is clear. It was REALLY hard to try and show the effect of the clear pen in a picture. All it lays down is sparkle - I was fascinated by this and can hardly wait to experiment more with it. For all those of you who have placed orders this month the little thank you notes that are included with your order have three of the colors used on it to add sparkle - red, melon and gold. One of my favorite ways to use the pen is to add highlights to a colored design (be it Prismacolored, watercolored, COPIC colored - whatever) to emphasize, or add details. For example on this angel I have used the pen to add shimmery red highlights to the berries, the plaid design on the dress, and the candlestick. 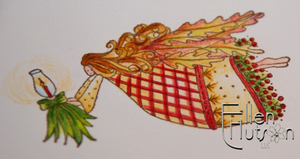 Gold was added to the leaf wings, hair and dots and tassles on her dress, and melon was added to the ribbon on the candlestick. What is interesting is that you won't see the same color line that you get with other product being that this goes on transparent. What I do get is an amazing shimmer with the added interest of transparent color that I just can't seem to capture with my camera. Thanks for all the great info on the Copic Markers and the Spica Glitter pens. I've just ordered the glitter pens! In the ordering process I saw the Alphabet Snap stamps. Are they still available?? WELL, THAT IS JUST TOTALLY NOT FAIR! CAN YOU ADD THESE TO MY ORDER! These are so cool. I'll still never be able to afford these marker sets, but they are really neat! You are such an enabler! I've had to just order all the colors you had! Can't wait to try them out!! Hope you're on the mend as well.